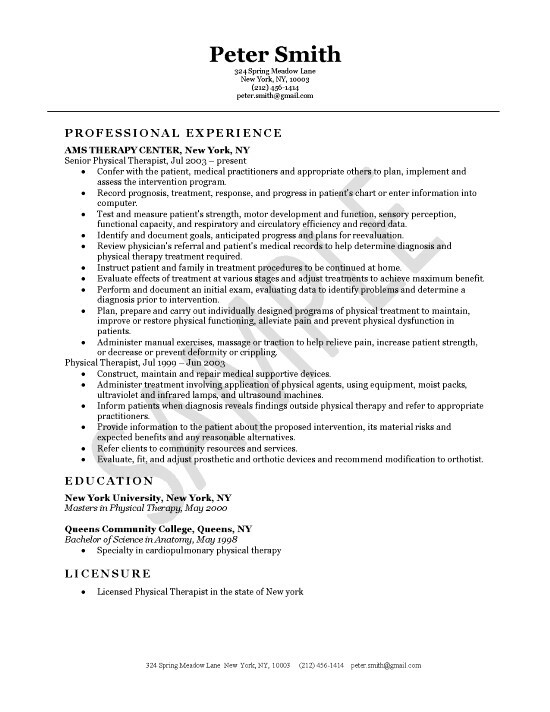 This page includes a resume for a professional with job experience as a Physical Therapist. The document can be a good resource for most medical therapist positions. The job experience section uses standard headings. The most recent position provides the bulk of the content. This section highlights their skills in physical assessment, physical therapy and treatment procedures. The document features experience in, training, exercise, stretching, massage and traction. The job seeker is also adept with exercise equipment and device maintenance. The training and education section documents their Bachelor of Science degree in Anatomy. The bottom line lists that they are a Licensed Physical Therapist in the state of New York. Perform physical therapy services to individuals of diverse ages from children to geriatric patients. Conduct inpatient therapy sessions fro acute rehabilitation. Instruct patients on proper exercises and therapies for outpatients or individuals ending internal training sessions. Coordinate client home care services by transferring medical data and recommendations to Physician of record. Evaluate and develop specific treatment programs for each individual patient. Create documentation that records type of therapy, length of exercises, repetitions, patient progress and periodic assessments. Provide support for rehabilitation services department, assisting therapy staff members when necessary. Implement therapy plans in accordance with clinic policy, federal regulations and internal health care standards. Provide consulting for third party caregivers, nurses or family members to promote scheduled ongoing therapy sessions and exercises.